The site is undergoing revision; a temporary archive of the first sentence analyses can be found here. Meet the writing of F. Scott Fitzgerald: the slow, graceful cadence, the deadpan preparation that leads beguilingly to the sudden, staggering sucker-punch. The Great Gatsby is one of the top contenders for the elusive title of 'Great American Novel'. It's a rather Gatsbyish concept in itself, that: where older cultures can rest complacently on a long-established tradition and other New Worlds seem more willing to move with the tide, writing and publishing good books without worrying about which of them most perfectly accessories their history - or at least, a search for 'The Great Canadian Novel' and 'The Great Australian Novel' turn up a modest 59,700 and 46,600 hits respectively to 'The Great American Novel's towering 8,810,000 - there's something in America that provokes a search for the great one, the great one, the green light at the end of literature that if we write deeper, stretch out our pens further, will one fine morning - But whether one considers the Great American Novel a useful concept or not, there's no question that The Great Gatsby is a great novel, and a great novel both of and about America. Fitzgerald's 'gift for turning language into something iridescent and surprising', as the critic Edmund Wilson so precisely put it, is on luminous and finally devastating display. The Great Gatsby is, for all its lucidity and its light page-count, a difficult book. The plot may be simple - James Gatz falls in love with a rich girl, becomes the wealthy Prohibition bootlegger Jay Gatsby in an attempt to win her, but when she runs over her husband Tom's mistress she callously lets Gatsby take the blame, Tom saves himself some aggro by pretending that Gatsby was the real lover, and the mistress's husband shoots and kills Gatsby - but its presentation is deceptive: rather than commenting or describing in depth, rather than helping us understand, Fitzgerald just quietly shows us things and lets us draw our own conclusions. The story lays small and great tragedies side by side and leaves us to judge, steering us only with its elegant, implicating prose. Reading The Great Gatsby is more like reading a poem than a novel: we have to meet the language halfway. I'll freely admit that I bounced off it in college - I was too young, and more than that too foreign to the culture it quietly savages, to quite understand what it was telling me. You have to read The Great Gatsby actively, and in my younger and more vulnerable years I hadn't mastered the activity it required of me. Another common complaint, apparently, is that the characters aren't likeable - and it's true, they're not, that's the point - and to that objection, the best answer can be found here and here in John Green's admirable Crash Course Literature series of vlogs. (Only a short series when it comes to literature, to my sorrow, as his main focus is on history - though I'd highly recommend his history vlogging too.) Reading The Great Gatsby is like listening through glass: you can see what's happening, but you have pay attention, watch closely, use your knowledge of human interaction to translate the snatches you do hear into a full, free exchange. It's 'unusually communicative in a reserved way', as Nick quickly says of his relationship with said quoted father, and we have to fall into that relationship right away - enter into reserved communication ourselves and start turning over The Great Gatsby's not-fully-expressed advice. We have to follow closely - because it's only in this act of following that we can be receptive enough to the conflicted sorrows and moral grief and blazing, half-concealed rage of Nick Carraway's narration. We have to be to Nick what Nick is to his father: listeners who understand more than what is said. What he speaks of is too deep, too complex, to be spoken of in more than hints. What is this first sentence, the place we begin to listen? To begin with, it's elegant. Soft consonants smooth throughout, only one T in twenty-three words, and a T that leads downhill onto the trochaic cushion of 'turning', and for the rest, Ys, Vs, Ss, Fs, nothing staccato or harsh on the ear. The words themselves are neither a rattle of monosyllables nor a thicket of polysyllables, but a pleasing medley of variation. Rhythmically, the sentence breaks down into three and a half rough beats: 'In my younger and more vulnerable years', the assonant U tying together the longer words; 'my father gave me some advice', the Fs and Vs leaning towards each other; 'that I've been turning over in my mind', the stressed syllables of 'turning', 'over' and 'mind' weighting the phrase towards the end and the downward drop of 'mind', which in turn pulls us towards the short half-phrase that carries in it so much time: 'ever since.' In 'ever since' is nostalgia and memory, the pondering of whether lessons from the past have been learned and understood - whether they have been, either financially or morally, profited from. We know from the sentence, then, that our narrator Nick considers himself to have been more vulnerable in the past, which is to say that things have happened which have hardened him: there's a breath of cynicism in amidst the wondering. It's a sentence of regret, in other words, regret and uncertainty, moving from vulnerable youth to parental advice which has not been finally decided upon. Nick has been 'turning over' his father's advice, and he still hasn't stopped turning it. Something has happened to close him off, and he still isn't entirely sure what to make of it - or rather, how to contextualise it, how to fit it into the scheme of simple certainties. A father's advice - perhaps especially in a country where 'Founding Fathers' are quasi-mythic figures and fatherhood can take on almost a sacred stature - is supposed to be wisdom speaking to inexperience, a piece of certainty that we can rely on. What our father told us when we were young enough to advise is morality from a time when we were young enough that moral certainties seemed possible. Nick, we are told in this sentence, is no longer in that comfortable place. He has the piece of wisdom, but in comparing it to his own experiences, he hasn't closed the issue. What is this piece of advice? We get it in the next sentence: 'Whenever you feel like criticising anyone ... just remember that all the people in this world haven't had the advantages that you've had.' While Nick acknowledges that the advice is given 'snobbishly' - the Carraways are a rich family, and for the unedifying reason that an ancestor paid someone else to fight in the Civil War (on which side, Nick doesn't disclose) so he'd be free to continue running his business - and in its folksy way, it might seem inoffensive: not everyone has our airs and graces, our education, our opportunities. It was nine o'clock - almost immediately afterward I looked at my watch and found it was ten. Mr McKee [a guest with an imperfectly washed face] was asleep on a chair with his fists clenched. Taking out my handkerchief I wiped from his cheek the remains of the spot of dried lather that had worried me all the afternoon. The little dog was sitting on the table looking with blind eyes through the smoke and from time to time groaning faintly. People disappeared, reappeared, made plans to go somewhere, and then lost each other, searched for each other, found each other a few feet away. Some time toward midnight Tom Buchanan and Mrs Wilson stood face to face discussing in impassioned voices whether Mrs Wilson had any right to mention Daisy's name. Making a short deft movement Tom Buchanan broke her nose with an open hand. Nothing prepares you for it: certainly not the incidents that come directly before. There's a more diffuse horror that occupies our attention: the rattling materialism that conflates luxuries and pet care and cute gadgets and mourning the dead all of a piece, and conflates, too, the act of buying things with the act of doing things - this is a world of consumers, not producers. Myrtle's manic flaunting of her lover's wealth, the drunken confusion, Nick's obsessive worrying about Mr McKee's shaving cream: all get us as disoriented and uncomfortable as Nick himself. The shaving cream spot is symptomatic: is Nick's worry compassion for the display Mr McKee is making of himself, snobbish disdain for poor grooming, or just a befuddled mind fixing on some small problem because when everything is wrong it's hard to know where to focus? We have to decide for ourselves - and in trying to decide, in craning to see whether the poor little dog is all right and trying to keep trace of slippery time, the distancing language of hearing the lovers 'discussing in impassioned voices' misleads us. It sounds so formal, so Jeevesian, and so buried in the middle of of a paragraph where things are happening in a vague, undifferentiated state, that we don't quite realise it's a stand-up screaming drunken fight until the dreadful, brutal simplicity of 'broke her nose'. Not 'hit her', but 'broke her nose', with that horrible adjective 'deft', as the skilled athlete deploys his physical perfection to batter his girlfriend. Language whirls and wavers and then strikes us into reality with a sudden crack. As I said, this is a book of the sucker-punch, and when it hits us unexpectedly, we reel. The first sentence sets us up for the first of these dizzying confusions, but not the worst. We just get prepared for the homily that not everyone has the same nice things, and then get struck with the assertion that not everyone has the same nice souls. What we don't know when we first encounter this book is that Nick is reflecting on something that deeply, irrevocably angers him: a man he has liked, cared about, tried almost successfully to be a friend to, has been destroyed with casual unconcern by people with even more 'advantages' than Nick. Gatsby is dead, and after all his prodigality, his lavish hospitality and generosity and charm, almost nobody bothered to attend his funeral. Gatsby has reached up towards the aristocracy, and as soon as the liquor dried up, the aristocracy dropped him like any other broken toy. And particularly culpable are the Buchanans, Nick's cousin Daisy and her thuggish, hyper-wealthy husband Tom: Daisy, who killed Tom's mistress Myrtle with her reckless (or possibly murderous) driving, and Tom, who spared himself the inconvenience of dealing with Myrtle's widowed husband by letting him assume that her real lover was Gatsby. Faced with the possibility of unpleasant consequences, they simply shrug them off onto the nearest convenient stooge, the nearest butler with an expendable nose, and carry on. Nick is bitterly angry at the beginning of this story, angry enough to commute his father's simple-sounding advice against judging people on externals into the deep, harsh judgement that people are not equal morally: that 'the fundamental decencies' - not even refraining from getting people killed, but as little as those many guests at Gatsby's parties who knew no better than to 'sneer most bitterly at Gatsby on the courage of Gatsby's liquor' - are not an evenly distributed resource. At this point, Nick feels or suspects, some people, maybe most people, are just bad. But at the same time, 'birth' is far from uncomplicated, because who you are born to be is, for everyone except Gatsby - and maybe even him by the end - an inescapable influence. You don't choose where you're born, and it's very, very hard to be something other than what you were born and raised for. Look, for instance, at the way this book begins by touching on the issue of parenthood. What's simpler than motherhood and apple pie? Well, practically everything, actually, but it's notable that of the many things wealth destroys in The Great Gatsby - cars, noses, valleys, lives - there is a deep fracture in that all-American institution, the family. Nick is as close to healthy as anybody here is going to get: he has left home with his father's blessing and some words of wisdom, even if he's too angry or too grieved to be sure whether they apply any more, and when he's had enough, he can go back home again and it's not so bad. But what remains for everyone else? This is a novel of the Roaring Twenties, the era of the young adult - the era of being twenty-something, in fact, which Nick, passing his thirtieth birthday, is just leaving, driving away from youth and 'toward death'. It is not an era of parenthood. The damage reverberates up and down the generations: Jay Gatsby, taken first by changed identity and then by death from a bewildered father who still calls him Jimmy; Pammy Buchanan, 'the well-disciplined child' who spends her life almost entirely with a nurse while her parents are busy with their wealth and adulteries. Henry Gatz loves his son, but it wasn't enough to keep the boy at home, or even to keep the son carrying his name: James Gatz raced away from his family into a life as Jay Gatsby at the first opportunity. Daisy coos over her 'bless-ed pre-cious' with perhaps genuine but certainly transitory affection: Pammy snuggles her glamorous mother only 'shyly' and is dismissed before she's had the time to say more than three things - 'I got dressed before luncheon,' 'Yes ... Aunt Jordan's got on a white dress too,' and 'Where's Daddy? ', two bids for approval in the only terms that interest her mother, and a question about her Daddy's whereabouts that Daisy doesn't bother to answer. Jimmy runs away from a home he feels ashamed of; Pammy is dressed up and brought out because, as Daisy says of herself, 'your mother wanted to show you off' - and to the man bent on stealing her from Pammy's Daddy at that. Even Myrtle Wilson's family love is more a matter of shopping than feeling: if she can spend Tom's money on a long-lasting wreath, it'll save her work on her mother's grave. Nick's family still matters to him, but then they can bestow inherited wealth along with the homespun wisdom. Everybody else is too busy chasing the dream. The first sentence of the novel is more or less a farewell to the undamaged family. The great Gatsby has no mentoring father, and will never be one himself. Love fails in The Great Gatsby. Nick still has some of it - enough to remember his father's advice, if not enough to be sure what to make of it, nor enough to make a relationship with Jordan Baker that doesn't end in hurting her, nor to do more for Gatsby in the end than bring his solitary presence to the dead man's funeral. Gatsby has too much of it - though whether for Daisy the woman or Daisy the social symbol, the feminine embodiment of his class aspirations, we never know: the class-born 'vast carelessness' of the Buchanans kills him before he can try the reality of her. Advice fails too: nothing would talk any sense into Gatsby, nor any 'fundamental decencies' into the Buchanans, nor does it keep Nick out of disasters, his own or other people's, until it's too late. What is the point, after all, of turning things over in your mind if nobody else is thinking? 'You said a bad driver was only safe until she met another bad driver,' Jordan reminds Nick, and thoughtlessness here careens out of too many side-streets for a single piece of advice to do anyone any good. There are the vulnerable and the invulnerable, and it's not age but money that makes them immune - money, and class, and 'carelessness'. So goes the opening quotation from 'Thomas Parke D'Invilliers' (which is to say, from Fitzgerald himself: 'Thomas Parke D'Invilliers' is a fictional character from his own first novel This Side of Paradise), and before it, the dedication: 'Once again to Zelda.' A declaration of love from a writer to his wife - his fated wife, we know in sad retrospect - followed by the half-comic, half-wistful tribute to Gatsby's aspirations. You can bounce high - but a bounce is not flight: eventually, you fall back down. Nick can fall back on his wealthy home and his reserved, communicative father. Gatsby does not have that luxury: what he had at home, he gave up for a greater luxury, the gold hat that might one day win him that fine morning. It doesn't, of course; Daisy isn't capable of creating a communicative home even with her vast wealth: her child isn't a protegee to advise but a doll to dress, display and dismiss, and whatever she feels for Gatsby isn't enough to outlast real trouble. She keeps moving forward as long as she has a place to go, and that is always. Gatsby does not have that endless horizon, except in his own hopes. 'So we beat on, boats against the current, borne ceaselessly back into the past,' Nick famously concludes. What we hear in the first sentence is our only hope of perspective: someone who is actually prepared to take seriously something what was said to him in the past, said by somebody from his past, and which in fact is an exhortation to remember the fact of other people's pasts before you draw any conclusions. Henry Gatz looks back to his lost Jimmy with helpless bewilderment; Gatsby runs into the future until he falls off the edge; Daisy hesitates and then keeps walking. Nick is the only anchor to our little boat in The Great Gatsby, not because he's a particularly good man, nor because his father or his forefathers were, nor even because his father's advice or his reaction to it were necessarily good, but for one reason alone: he's the only person who can both understand the impulse to race for the receding future and can look back into the flowing past. This site is undergoing some revision; a temporary archive of the first sentence pieces can be found here. Where do we begin on this one? Middlemarch is one of those books that mounts its beginning slowly: two pages of 'Prelude' that set out its central theme - an infinitesimal proportion of the whole massive tome - before drawing the curtain back on the opening chapter. Dorothea Brooke is our central character in a large and closely-studied cast, and when we first see her, she is carefully mounted for our consideration in a firmly-delineated context. If we consider a book as beginning in its first sentence, the first sentence of the book proper is that of the opening chapter; the 'Prelude', as Eliot musically termed it, is more in the nature of preparation, directions for how we should read the book once it really begins. Which is, in itself, rather a fascinating device. Eliot is an author loved by many readers as compassionate and insightful, while others find themselves disliking her, resistant to the pressure of her prose and uneasy with the personal passion that sometimes animates her supposedly omniscient narration. 'Those who fall foul of George Eliot do so, we incline to think, on account of her heroines; and with good reason; for there is no doubt that they bring out the worst of her, lead her into difficult places, make her self-conscious, didactic, and occasionally vulgar,' wrote Virginia Woolf, and Dorothea, the most heroic of Eliot's heroines, can occupy that disquieting space, that literary uncanny valley between author and character that is merely ridiculous when created by a lesser author but in hands as formidable as Eliot's can polarise readers to passionate identification, revolted contempt, or the kind of forgiving ambivalence that no careful critic feels impudent enough to bestow on such a writer with anything resembling ease. Dorothea is a mixed blessing, in other words, and the more so because we're told who she is and how we should regard her before we ever see her move a limb or speak a word. For us, confining ourselves to the question of first sentences, the very fact that she gets two whole pages of Prelude preparing us for the first sentence that introduces her is symptomatic: we are not permitted to enter this book with the freedom we ordinarily expect. Later on in the novel Eliot's grand morals relax enough to enjoy some gentle ironies at Dorothea's expense, and in those moments she becomes a loveable creation in the good old Eliot style and we draw a breath of relief - a personal favourite is the comment about the conflict between her imperfect asceticism and her genteel skill at riding: 'Riding was an indulgence she allowed herself in spite of conscientious qualms; she felt that she enjoyed it in a pagan sensuous way, and always looked forward to renouncing it,' - but as Middlemarch opens, we feel the full weight of its ambition, the massive scope both of scale and subject. As we begin Middlemarch, we have to decide whether to accept Eliot on her own terms, and if not, what terms we can strike with her mighty shade. Who that cares to know much of the history of man, and how the mysterious mixture behaves under the varying experiments of Time, has not dwelt, at least briefly, on the life of Saint Theresa, has not smiled with some gentleness at the thought of the little girl walking forth one morning hand-in-hand with her still smaller brother, to go and seek martyrdom in the country of the Moors? The story is of the Carmelite founder, who ran away at the age of seven with her brother Rodrigo, 'hearts already beating to a national idea; until domestic reality met them in the shape of uncles, and turned them back from their great resolve.' Eliot's point, which she advances like an essayist, is that in the absence of a 'coherent social faith and order', a woman of Saint Theresa's disposition will simply yearn for 'an unattained goodness' and stumble over hindrances - 'domestic reality' preventing great spiritual accomplishment. There is no question as to how we should regard Dorothea when we meet her: she is an uncanonised saint, unable to do great deeds because of the chafing realities of contemporary life. Or at least, not quite contemporary - the book was begun in 1869 and set in the 1830s - but close enough that the contemporary reader could recognise their own society, and hear the voice of a female author addressing grievances and controversies not yet settled. What we can see straight away is that Eliot has no intention of holding back on the didacticism. To a modern reader the sentence is classical, with its Chinese-puzzle-ball subclauses within subclauses, its reliance on the patience of the audience with a long and measured stretch of neatly comma'd prose, its personification of 'Time' as a quasi-mythological figure for a readership raised on the Greek and Roman authors ... but at the same time, just as she alludes to historical figures and invokes the leaning figure of Chronos, she is equally prepared to seize upon authorities and insights that were new and compelling for her day. We do not hear of the 'trials of Time': we hear of the 'experiments of Time', trying out 'how the mysterious mixture behaves'. We are not in Time's amphitheatre here: we are in Time's laboratory. In a stroke, Eliot showcases both traditional and progressive learning, an almost-surreal juxtaposition and almost-wry nod to the way that Time itself is changing, that social forces come and go and it may be our good or bad fortune to find ourselves born amidst them - and, too, an unambiguous display of her own intelligence and learning, a confident assertion of her authority. Later in the novel, of course, we will meet Dorothea's closest counterpart in Dr Tertius Lydgate, an aspiring man of science whose great ideals come to no grander achievements than Dorothea's spiritual ones, faith and reason alike falling by the wayside of human mistakes and social pressures: in beginning with science, Eliot places herself just a little on the side from Dorothea even as she rails against her frustrations. There's a little humour and a little distance here, a lightness of touch with the imagery that grants the sentence a sprightliness that belies its length. Sprightly though it is, however, we are still to take it seriously. If we do not smile with some gentleness and take some interest in the case of Saint Theresa, we stand accused of being outside the honest ranks of those who 'care to' know much of history or human nature. We are exhorted to share Eliot's favouritism and partake of her education: if we accept her assumption of our complicity it reads as benign, a kind of rhetorical figure bestowing on us intelligence and good will; if we don't, on the other hand, the sentence doesn't seem to think very well of us. In other words, there is an implicit assertion in this sentence that there is a right way to think: right subjects for contemplation and right feelings to have towards them. Eliot is generous with her pretence that we, the readers, must already think in this right and well-informed way - even a brief moment thinking kindly on the infant Saint will do - but there's no room to differ with her. This is a big sentence talking about a big idea, and it encompasses a great many moods: the didacticism of Eliot's tone tempered by her mild amusement at shaking the metaphysical together with the chemical, and in the midst of it, the 'gentleness', the compassion, towards the vulnerable child. It's a very Eliot sentence. Reach constantly at something that is near it." We've already been told in no uncertain terms that the lack of social outlets may make of a saint a 'foundress of nothing'; here, it's made even clearer exactly what the problem is: in this world, a Saint Theresa will be held back 'because a woman.' Even if we aren't familiar with the play itself, there's the word 'Tragedy' right in its title. We're well and truly primed to meet our maid. After all the rhetorical weight of the prologue, a sentence as simple as the 'poor dress' it invokes. Grammatically simple, that is; there's nothing simple about its content. Character names are always important in fiction, and it's interesting that we first meet the woman who will be referred to as 'Dorothea' hereafter as 'Miss Brooke.' 'Dorothea' is a fairly obvious reference to her religious disposition: the name means 'gift of God', and a reader with even the most modest knowledge of Classical tongues or etymology will recognise the feminised 'theos', the same Greek root that gives us 'theology' and 'monotheism'. It's a name that elevates female frustration to Christhood, really: Dorothea is a gift that the world does not appreciate. 'Brooke', though, has the same simplicity as her dress, a natural and unpretentious - though not plebeian - surname. It's significant, perhaps, that the final image of Dorothea compares her to a river: 'Her full nature, like that river of which Cyrus broke the strength, spent itself in channels which had no great name on the earth.' The final estimation of Dorothea is more optimistic and less angry than the prelude, regarding her virtue as 'incalculably diffusive' and benefitting 'the growing good of the world' in small ways, but whether provokes hope or despair, the book opens and closes with the image of a forceful nature thwarted and dissipated. Dorothea may be 'like that river', but her surname does not allow for anything more surging than a quiet brook. She is bigger than her name, but will have no greater channel, and we know this straight away. We could get all this from 'Dorothea Brooke', though; instead, we get 'Miss.' This tells us two things. First, she is either the only or the eldest daughter of the family: the convention of the time was that the oldest daughter would be 'Miss Brooke' and younger sisters would be, for instance, 'Miss Celia Brooke', distinguished by their Christian names while the oldest unmarried woman would showcase the surname. (You can see the same thing in Pride and Prejudice, where Jane is Miss Bennet and Elizabeth is Miss Elizabeth Bennet.) Second, Miss Brooke is a lady, and seen by the eyes of the world: it's not quite George Eliot's voice that speaks of Miss Brooke's beauty, but the society that knows her only well enough to use her formal name, and consequently notices her beauty before anything else. Eliot is at pains, meanwhile, to point out that Dorothea, unlike a conventional young woman of her time, is not inclined to accentuate her beauty with finery. It's 'poor dress', we notice, not 'plain dress', but 'poor', deliberately mortifying the vanity: the sentence is fraught with ambivalence. Dorothea gets the best of both worlds, above the trivialities of beauty both because she disdains to cultivate it and because she already has it: her beauty to us, it's implied, rests at least in part because she prefers the spiritual path. But at the same time, her inner beauty is frequently expressed in the book through her outer beauty; when she first meets her future husband Will Ladislaw, for instance, he is inclined to dislike her because she is engaged to marry his disliked cousin, but is unable to avoid noticing her outer loveliness - and in a way that hints at inner depths: 'But what a voice! It was like the voice of a soul that had once lived in an Aeolian harp.' Hostile as he is, Will's reaction can at this point be little more than physical attraction, but even so, her charm is cast in terms of 'soul' - is written, in fact, as provoking a physical attraction that correctly recognises the outer beauty as an expression of inner grace, even though Will doesn't believe it to be so at the time. Dorothea's external beauty often is written as if it sprung from inner qualities, in fact, even though it shouldn't be so in a novel that punishes men precisely for the sin of conflating the two, where plain, shrewd Mary Garth is Fred Vincy's salvation and beautiful, shallow Rosamund Vincy is Lydgate's destruction. is not a face we can impose upon Dorothea. 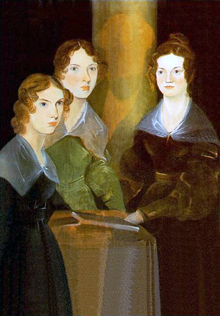 - shows three young women who could be called either plain or pretty depending on taste and attitude, or perhaps are best suited by the mid-point of Jane Austen's deadpan scale in Emma: 'very pretty indeed, or only rather pretty, or not pretty at all'; none possessed Eliot's unforgiving features. There's something about that portrait of Eliot, that soulful gaze and nicely-arranged hair, that makes us want to find beauty in it, to try to look back at it with the same sad tenderness that she watches us, and frustrates us when we can find only the charm of expression and intelligence. Those thoughtful eyes make us ashamed of ourselves both for being unable to find beauty and for looking for it in the first place; what we cannot do is study the image dispassionately. It's too evocative. 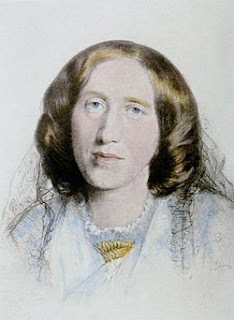 So maybe it is just that George Eliot had a memorable face that comes between us and her heroines. Or perhaps it may be the difference in a portraitist's skill: Branwell was gifted and his portrait is piquant, but he could not create the breathing likeness that Burton did: those assessing, appealing eyes gaze out at us more vividly than out of most author portraits, female or male. But at the same time, we have to admit that Eliot does dwell on the beauty of her protagonists, and uses it to express things about them. (It occurs to me that the only other author I've seen people compare to her characters in this way is Ayn Rand, another emphatic, didactic author who made much play of appearance as a kind of human pathetic fallacy, bestowing an ideological aesthetic on her characters that she herself lacked. Rand was unquestionably the inferior author and the lesser judge of human nature, but it is, at least, a thought-provoking comparison.) What are we seeing in this whole essay, after all, if not the fact that Eliot chose to open her most famous and ambitious novel - one of the most famous and ambitious novels in the history of literature - with the statement that her heroine is beautiful? For a plain woman to give her protagonist the beauty she herself lacks is by now a common joke, and George Eliot herself was witty enough in poking fun at the fantasy in her notorious essay 'Silly Novels By Lady Novelists', lambasting the dreamy heroine thus: 'Her eyes and her wit are both dazzling; her nose and her morals are alike free from any tendency to irregularity; she has a superb contralto and a superb intellect; she is perfectly well dressed and perfectly religious; she dances like a sylph, and reads the Bible in the original tongues.' Dorothea is, of course, a far more human creation than this: her intellect is frustrated by lack of education (she can not read the Bible in the original tongues; she can't even read enough German to save her first husband from his ignorance of modern scholarship), her dancing and singing and ornamental arts are nothing to the purpose (her sister's piano playing being curtly dismissed as 'a kind of small tinkling which symbolized the aesthetic part of the young ladies' education'), and she makes mistakes because her wit and her morals can lead her astray. But on the other hand, are the conflation of eyes and wit, nose and morals, except in their bathetic phrasing, entirely absent from Dorothea's beauty that is all the more flattered because she is not 'perfectly well dressed'? Except, moreover, that she actually is perfectly well dressed to suit her own style of beauty, and her 'poor dress' is partly a sign of genteel taste, Dorothea and Celia both being well-born enough to have 'regarded frippery as the ambition of a huckster's daughter'? Dorothea is perfectly well-dressed, right there in the first sentence; just more subtly than a silly heroine bedecked with endless frills. Dorothea's eyes do express her wit, or rather her soul; she is perfectly religious - or at least, explicitly saintly, and the story begins by blaming her imperfect religious accomplishments on her circumstances before we ever meet her. And the very first thing we do meet is the blunt statement that her beauty, her ladylike tastes and her religious aspirations all accessorise very nicely, thank you. It provokes the insolent question that no conscientious reader likes imposing on so obviously superior an intellect: is Dorothea simply a better version of the same fantasy girl of the silly lady novelists? Bestowed with beauty of person and mind, but placed in circumstances to make mistakes and endure consequences that are still, in the end, mostly favourable? In the silly novel, 'the tedious husband dies in his bed requesting his wife, as a particular favor to him, to marry the man she loves best, and having already dispatched a note to the lover informing him of the comfortable arrangement'; Dorothea's marrying 'the man she loves best' involves the contrary arrangement, a codicil in her first husband's will disinheriting her if she marries Will Ladislaw - but then, she explicitly has her own modest fortune on which the Ladislaws can 'live quite well', and her 'tedious husband' does indeed die. He dies laying down inconveniences, but they do not, in the end, prevent her from a happy second romance. Is Dorothea's poorly-dressed beauty, then, an expression of the same hunger that silly lady novelists more crudely communicate? Or else, perhaps, is that the wrong question? It is, instead, that Eliot, having written the satirical essay in 1856, set out a decade later to grapple with the same questions that beset all 'lady novelists' of the time, the sheer fact that what you looked like mattered a great deal and that marriage was usually the centre of a woman's life, and decided to do it properly? Eliot's pious pretty women, Dorothea Brooke and Maggie Tulliver and Dinah Morris, all have to navigate beauty and its temptations; only Dinah has the simplicity to disregard it entirely (and it's notable that not she but her future husband, the more complex Adam Bede, is the protagonist of that novel); the social pressures of which Eliot wrote were the same social pressures that afflicted all women 'because a woman'. As Woolf commented in her essay quoted above, 'The ancient consciousness of woman, charged with suffering and sensibility, and for so many ages dumb, seems in them to have brimmed and overflowed and uttered a demand for something - they scarcely know what - for something that is perhaps incompatible with the facts of human existence. George Eliot had far too strong an intelligence to tamper with those facts, and too broad a humour to mitigate the truth because it was a stern one.' Woolf is speaking of unfulfilled emotional drama there, Eliot's heroines whose stories end with less grandeur than their beginnings promised, but we can perhaps draw the same conclusion about her relationship to beauty: it simply was to her what money was to Jane Austen, an inescapable fact of life all the more urgent, and thus all the more artistically undeniable, because she did not have enough of it. We think much of what we lack, and the sheer injustice of beauty or ugliness is an impossible question to settle. For to view Dorothea merely as a fantasy, a higher-order heroine of a silly lady's novel, is to ignore the sheer artistry of her creation - which is, after all, the ultimate issue in fiction. To say that Dorothea resembles a silly lady heroine except that she's well written is to miss the whole point: we might as well say that Eliot resembles a stupid writer except that she isn't stupid. The only distinction in art that is finally meaningful is whether it is good or bad. And even in this first sentence, there is no question that Dorothea is an artistic creation, taking shape under our very eyes. 'Dorothea is posed statically, as if sitting for a verbal portrait, and is actually compared to a figure in a painting,' David Lodge remarks in Chapter 14 of The Art of Fiction, but in this first sentence, note the use of the phrase 'thrown into relief'. It's a convenient figure of speech, but there's nothing casual about it: 'relief' refers to a specific artistic method, the sculptural technique of raising a figure above its flat background. She's a sculpture in the first sentence, a 'Blessed Virgin' of 'Italian painters' in the second: while she lives in a relatively modern era - which will be precisely the problem for her as she tries to live a worthy life in mundane surroundings - she is verbally and visually tied to more heroic eras, the Classical and Renaissance traditions that her sculpted, painted echoes invoke. Every era is mundane to the majority of people living in it, of course, but Eliot is openly linking Dorothea to a grand artistic past, and a past of religious art at that, hinting at the ambition she has committed herself to - and an ambition that will come far closer to fruition than Dorothea's unfocused yearnings ever will. Eliot is such an essayist as well as such a novelist, so open in her assertions of principle, morality and insight, that it's unusually difficult to separate Eliot the novelist from Eliot the person; George Eliot and Mary Ann Evans seem to jostle for our attention on these pages. It can be a disquieting experience if we resist being swept away, for this is a novel of undoubted and extraordinary accomplishment, and to find the fundamental question of how much is novelist and how much is novel - and if some of it is both, how much of this is strategic and how much unconscious - is not something we normally have to worry about in novels this bloody good. Drawing an unclear line between writer and narrative voice is supposed to be the province of incompetent dabblers, not titans like George Eliot; it can be uncomfortable wondering something so personal, so basic, about a writer so obviously more intelligent than ourselves. We sit at the feet of a teacher, and wonder exactly what we're being taught. But this, in the end, is for our own good. As Woolf says, Middlemarch is a novel for 'grown-up people', and a good teacher requires us to grow up in relation to her lessons as well as the world. Eliot's subject is always the question of steering a soul through wayward waters, the difficulty of distinguishing between what we know to be true and what we merely wish, and her characters were so revolutionary precisely because it was she who, as D.H. Lawrence put it, 'started putting all the action inside,' pioneering with headlong mastery the art of treating internal conflicts as plot events and people's partial blindness to themselves as an essential quality of being human. We can accept her without question and have a marvellous, insightful read. If we choose not to, then we must grapple with her. But who taught us how to grapple with a written person's self-knowledge in the first place? Eliot. There's a popular saying that there's no point arguing with an idiot because they will drag you down to their level and then beat you with experience; resisting Eliot's rhetoric, though, is far closer to wrestling with Jacob's angel. She doesn't drag us down to her level, she drags us up, and even if we do end up questioning some of her choices - her shifting partisanship towards her characters, her contradictory handling of beauty, her passionate, earnest moralising under the guise of omniscience - we can question without drawing conclusions, grapple and pause and draw breath, stronger and sharper for the experience. It's Eliot's intelligence, not our own, that gets us even asking whether she was a little blind to herself, because it's Eliot's prose that teaches us how to ask and consider that very question; whether we consider the answer to be yes or no, it's her score off us, not ours off her, that we ask it at all. We are only following the lessons she taught us. Look at this essay, for example. It's supposed to be a simple question: what does the first sentence of a famous novel teach us about writing? Yet to answer the question in any kind of responsible way, I wasn't able to confine myself to talking about a single sentence. Two pages of prelude, one quotation and a seventeen-word sentence with no subclauses, and I've had to go ten rounds with George Eliot and emerge still questioning whether I had any right to question her in the first place. This is the genius of Eliot: whether we question her or not, she will not leave our intelligence alone. She overwhelms us with hers and forces us to engage our own. In the fullest sense, she does what great literature is supposed above all to do: she makes us think. I take requests, so if anyone has a particular first sentence they'd like to see analysed, mention it in the comment threads. Some requests I do, some I don't; my criteria are twofold. First, having tried to do it with books I haven't read and found I churned out worse analyses in consequence, I'm less likely to tackle a book that I haven't read already. I have a book to rewrite and a toddler to raise, so reading an entire book just for one of these posts is unlikely to happen unless it's a book I've been meaning to read for my own satisfaction. So if someone requests a book, I haven't read it and I don't feel a burning desire to do so, there won't be much I can say. Second, I don't analyse first sentences or books that I don't think are good; I'm not interested in scoring cheap points off bad writers when there are so many good writers I could be talking about instead. Sometimes there are things to be said about the implications of poor work, and I've done that now and again here, but when it comes to close analysis I want to talk about the good stuff. At some point in the future I might try analysing what's wrong with some bad prose, but in that case I'll be favouring dead authors as I have no desire to take pot shots at the living either. The upshot is that if you request a book by a living author and it's a book I don't like or admire, chances are I won't do that one either. So, if you came over from Tor, hello and welcome, and I hope you enjoy this series. Kit: Good grief, another dead mouse? Mika: Mika the Merciless strikes again! Kit: Honey, what's with all the hunting lately? This is the third mouse this week. Mika: First dead one. You is bad kitten. Kit: I think you mean 'Kit', honey. Mika: No, is bad kitten. Mika the Master brings in mousies to show you how to hunt. And what does you do? Kit: We rescue the live ones and release them in the garden? Mika: Exactly. You takes Mika's mousies away. Will never learn if keep doing this. Kit: Well, honey, we feel sorry for them. And we worry that if they run away and die in the house, they'll rot and stink. You rememeber what happened last year. It was like a charnel house. Mika: Go stand in corner or cuffs your ear. Kit: Mika, darling, you aren't our mother. Kit: And I'm worried about your health. You remember the vet this week? Mika: Aaagh! Trauma! Horror! Disgrace! Kit: They had to treat you for constipation? And they said it might be because you had mouse bones in your gut? Mika: You delivers Mika over to enemies! Kit: That's enemas, sweetie. You were throwing up all over the place. Mika: Is awful, awful world. And why you get Mika if you don't want mouser? Kit: I know, sweetie. It's just finding their exploded corpses under my chair wheels that upsets me. Kit: Mika, stop clawing that sofa at once! Mika: Ah good, you hears my summons. Mika wants food. Kit: Mika, did you claw that sofa just to get my attention? Kit: Mika, that's naughty. It's an expensive piece of furniture, not a bell-pull. Mika: Mika mewed, you did not immediately do biddin. You is poor servant. Shouldn't have to tell you twice. Kit: Well, if you're going to scratch the sofa, I'm not going to pay attention to you. Kit: My, what a quiet evening it is, with nothing to disturb my attention. Kit: Yes, I do love a serene evening with no one bothering me. Kit: Oh, hello, sweetie. Was that you mewing? Do you want food? Kit: Well, you had only to ask. Mika: Come revolution, you will be first against the wall. Oh look, food! I went to London Zoo last Sunday and visited their new butterfly house, where I made a new friend. It was a butterfly, and it really, really liked me. I didn't notice anything until I felt warm air blowing over my face, fanned by the butterfly's wings, but when I looked up, there was this big, black and white butterfly, hovering above me with a really tempted air. I stood still, and it came down and landed on my hat. It sat there for a while, then took off, but it didn't go away; it kept on hovering. I stepped left. The butterfly followed. I stepped right. It followed again, getting lower and lower. It landed again, this time on my shoulder, taking off when I turned to look, then hovered again. It had exactly the manner of a customer hesitating outside a shop full of expensive but desirable stuff: nearly making up its mind to proceed, but wanting just a little more time to dither. But then it succumbed, and landed on my hat again. I'd like to consider this a sign of some exceptionally benificent aura my soul was projecting, but honesty compels me to admit that it was probably the sequins. Butterflies like bright colours, it seems, and the shiny bits on my woolly hat were simply too much for it resist. I knew I liked that hat.